You can manually send your Client Tasks, or schedule them to send automatically. Client Tasks can be manually sent immediately, or scheduled to automatically send in the future. They can only be sent to people you have saved as a contact. The Client Tasks will always be sent to the email address used on the primary contact card for that contact. Your Client Tasks will send in an email to your client. These emails and responses from your client, will show on the contact and work timelines. To set up the sending of your Client Tasks, select Sending Settings for the Client Task section that you want to send. You'll then be presented with a box to choose who you will send your Client Tasks to, and who from. 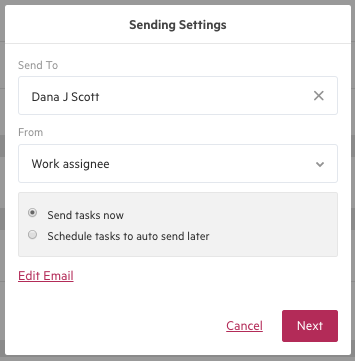 Choose "Send tasks now" to manually send. The email containing the Client Tasks will be sent from the team member you have specified in the From field. You can schedule Client Tasks to auto send in the future, a certain number of days before or after the work item's start date (for a template) or on a specific date (for a work item). Once you have chosen your date, click Next. Gentle reminders: send seven days before the task due date, on the task due date and then everyday after a task is overdue. 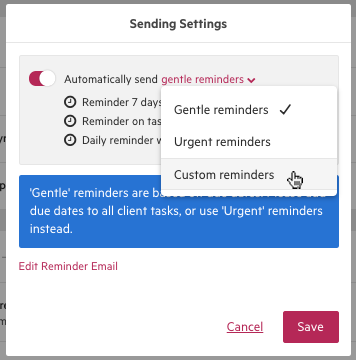 Custom reminders: customize the frequency and select how often your clients will receive reminder emails. You can then click Save to set your client tasks to send.